David Lehman is originally from Maple Heights, Ohio, where he began studying percussion. After completing his undergraduate work in Music Education from Marycrest and St. Ambrose College in Davenport, Iowa, he began teaching band in Franklin Grove, Illinois. From there he moved to Fulton, Illinois, and taught there until 1979 when he moved to DeKalb and has taught ever since. He has graduate degrees in Music Education and Instructional Design from Northern Illinois University. It was after coming to DeKalb that Dave first began studying the oboe with Earl Clemens, then oboe instructor at NIU and principal oboist with the Kishwaukee Symphony Orchestra. At this time, Dave played in the percussion section of the KSO, and occasionally would fill in on English Horn or second oboe as needed. “I felt that I needed a better understanding of the double reed instruments to be a better teacher and band director for the students in DeKalb. Dave has played oboe and English horn in numerous ensembles, including the NIU Philharmonic, NIU Wind Symphony, NIU Wind Ensemble, Illinois Valley Community Orchestra, Illinois Valley Community College Winds Ensemble, Spring Valley Municipal Band, Dixon Municipal Band, and DeKalb Festival Chorus. As a member of “Stille Point”, Dave traveled to Israel and Rome in October of 2000. He also plays oboe and English horn in the DeKalb Municipal Band, the University Band, and regularly at the Newman Center in DeKalb. 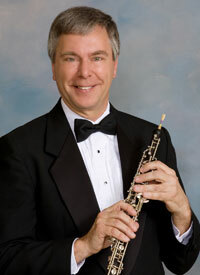 Dave took over the position of principal oboist with the KSO when Mr. Clemens retired in 2000.